Heather Johnson left her day job and her home in New Jersey about two years ago to travel across the United States. She had little more than the clothes on her back, the transport of her Triumph motorcycle, and the inklings of an innovative art project. Along her journey, she would make an exchange. 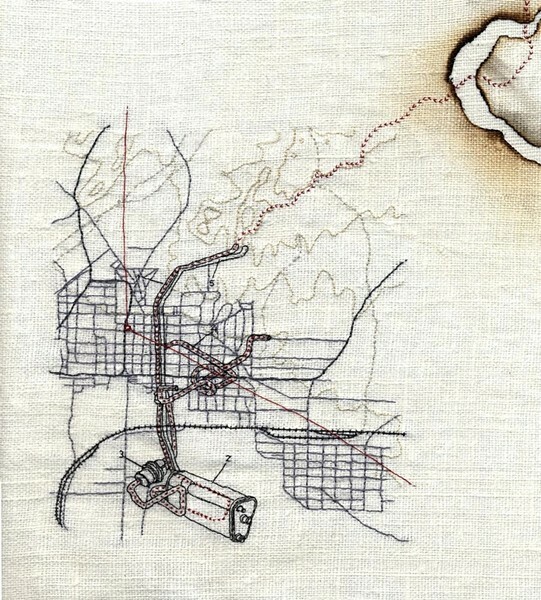 At areas of particular interest—sites of major earthworks, public parks, national monuments—Johnson would leave behind a piece of hand-embroidered art for future visitors to stumble across and cherish. The project, now called In Search of the Frightening and Beautiful, can currently be seen at Cal Poly’s University Art Gallery. So what exactly kick-started this artistic odyssey? When you hear Johnson talk about her travels, about cutting off the stability of her former life and living out on the roads alone, it’s endlessly intriguing, but as her project’s title suggests, it’s a little frightening as well. Why do this now? Why embroidery? Why travel on a motorcycle more than 10,000 miles throughout the United States and Mexico with little to no previous experience? Even as a young kid, Johnson had an intimate link to the land and her surroundings. She was born in Wahiawa, Hawaii, and moved around extensively before attending San Francisco’s California College of the Arts for her MFA. Since then, Johnson has shown her work—which varies in medium and display from landscape watercolors to collaborative public art projects—in galleries throughout the United States, Europe, and Japan. A few years ago, she got in contact with BoxoHOUSE—an art residency program in Joshua Tree sponsored by the contemporary art cooperative BoxoPROJECTS. They invited her over, she’d recently become a motorcycle enthusiast, and so, the conditions were perfect. Johnson would ride to Joshua Tree and back, scattering her hand-crafted treasures along the way. The first time around, the trip only took three months. When she returned to New Jersey, she spent the rest of that summer weaving her experiences into her intricate embroidery pieces. But something had changed. 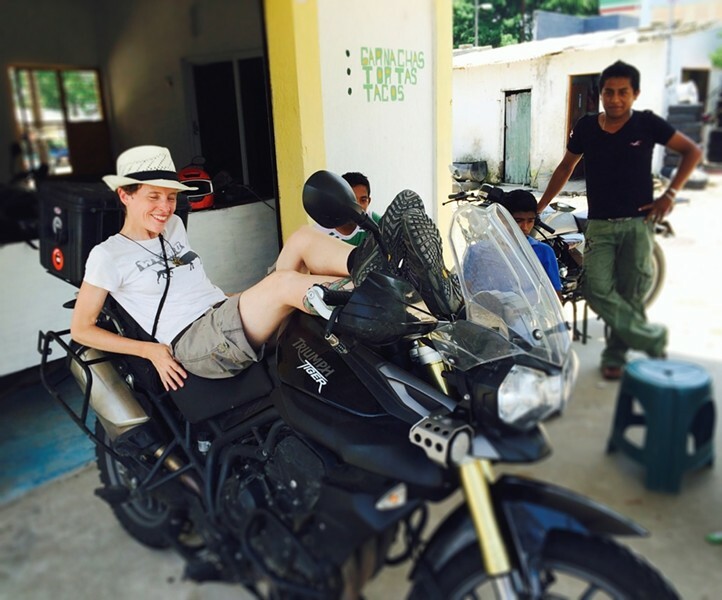 LAID BACK: Heather Johnson (left) rests on her Triumph Tiger in La Venta, Tabasco, Mexico after it broke down when she hit a pothole. Fortunately, Johnson wasn’t entirely without resources. She had an opportunity to housesit in Mexico, and so, armed only with a smattering of Spanish and her own instincts, she headed into the deserts, jungles, and swampy terrain of Mexico for a two-month sojourn of unanticipated struggles and self-discovery. Deep along the Mexican coastline, just before the Yucatan peninsula, in Tabasco, Johnson’s bike broke down. She hit a pothole and her suspension compressed beyond easy repair. A young man approached and tried to help. Together, they brought the bike back to his village where he then helped push it onto the back of a vegetable truck so her journey could continue. It’s experiences like this that motivate Johnson’s art and nomadic lifestyle. Johnson’s artwork reflects this tenacity and self-reliance. Her embroidery is complex, layered, and stunning not only because of the stories that surround it, but because of the sheer skill behind it. The primary images in her pieces are taken from the shop manual to her 2012 Triumph Tiger. In meticulous lines of black, blue, red, and beige, Johnson stitches gear pieces, sprockets, labels, topographical contours, and map grids. They’re masterful creations that embody Johnson’s experiences, but they do more than just reflect. They act as an exchange between artist and audience and as a reprieve from Johnson’s constantly shifting environment. STITCH IN TIME: Heather Johnson’s In Search of the Frightening and Beautiful opens on Nov. 6 at Cal Poly’s University Art Gallery. The exhibit runs through Dec. 5. There will be an opening reception and artist talk there on Nov. 6, at 5 p.m. For more information, visit artgallery.calpoly.edu. There may be a tension between the product, process, and the pilgrimage behind Johnson’s art, but they are all a means of interaction. When she places a piece near a mine, a park, or a monument, it’s meant as an offering. It’s there to give back, to give someone else a memory tied to the specificity of that space and time, and to create a connection that would otherwise be absent. Jessica Peña wishes she could light out west. Send her travel money at jpena@newtimesslo.com.